Doesn’t the fall just make you want to go out and play with all the beautiful fall leaves? 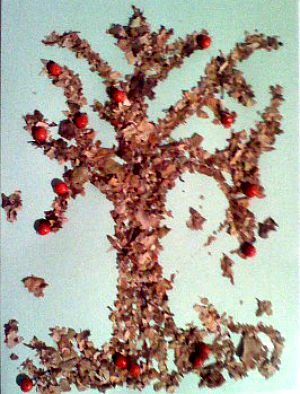 It brings out memories, real or imagined, of running and joyfully jumping into a pile of leaves. 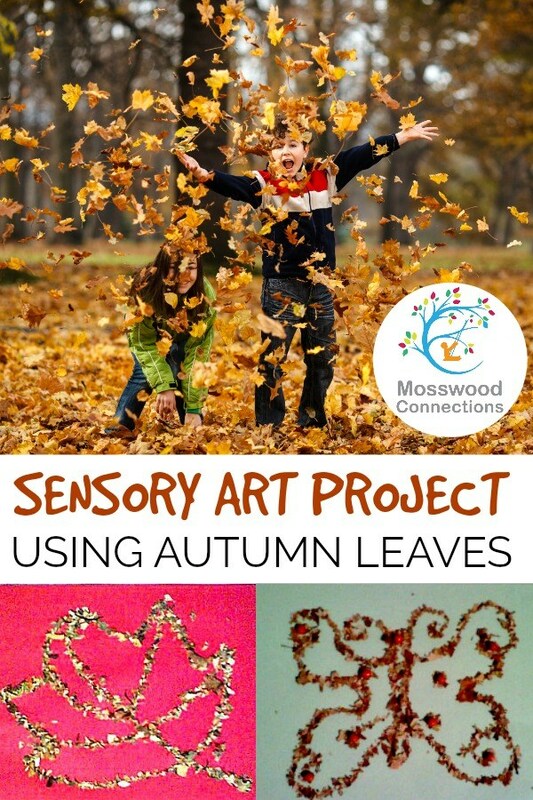 This Sensory Autumn Art Project gives you a reason to play with leaves. Crumbling the dried leaves will give you an awesome sensory experience. Give it a try, it’s kind of addicting. 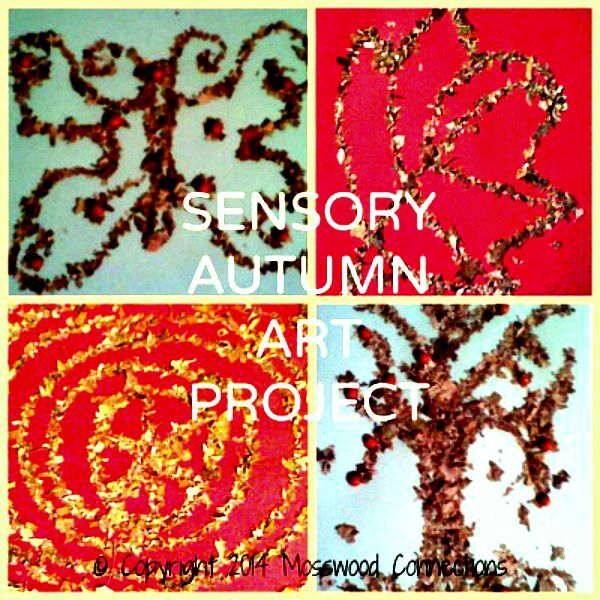 Enjoy an Autumn Art Sensory Experience! Go for a walk and collect leaves in a basket or bag. Talk about why leaves change color in the fall. The explanation follows. Now it’s time to crumble the leaves. We let ours sit for a day after we collected them to allow them time to dry. Jump on the bag and crush all the leaves. (This is really fun.) Crumble the leaves with your hands for a satisfying sensory experience. 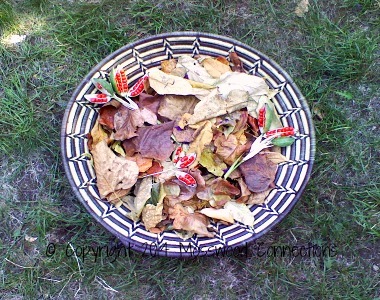 Collect some crunchy dry leaves, then crumple them up! 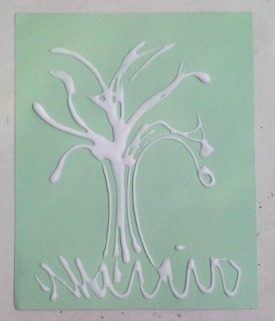 Paint or squeeze the glue on the paper to make a design. 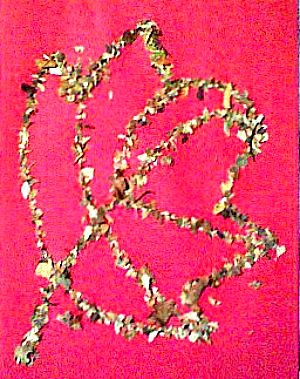 Sprinkle the crushed leaves on the glue outline. 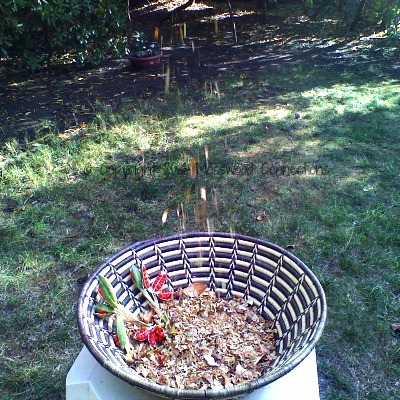 Shake off the excess leaf crumbles. Use other objects, like sticks or moss that you have collected to add details. Tell a story about your picture. Leaves are a plant’s food factories. They take water from the ground through their roots and take a gas called carbon dioxide from the air. Plants use sunlight to turn water and carbon dioxide into oxygen and glucose. That's one way that plants help us. They produce the oxygen in the air that we need to breathe. Glucose is a kind of sugar. Plants use glucose as food for energy and as a building block for growing. The way plants turn water and carbon dioxide into oxygen and sugar is called photosynthesis. Plants have a chemical called chlorophyll that helps make photosynthesis happen. Chlorophyll is what gives plants their green color. As summer ends and autumn comes, the days get shorter and shorter. This is how the trees “know” to begin getting ready for winter. During winter, there is not enough light or water for photosynthesis. The trees will rest, and live off the food they stored during the summer. They begin to shut down their food-making factories. The green chlorophyll disappears from the leaves. As the bright green fades away, we begin to see yellow and orange colors. Small amounts of these colors have been in the leaves all along. We just can’t see them in the summer, because they are covered up by the green chlorophyll. The bright reds and purples we see in leaves are made mostly in the fall. In some trees, like maples, glucose is trapped in the leaves after photosynthesis stops. Sunlight and the cool nights of autumn cause the leaves to turn this glucose into a red color. The brown color of trees like oaks is made from wastes left in the leaves.